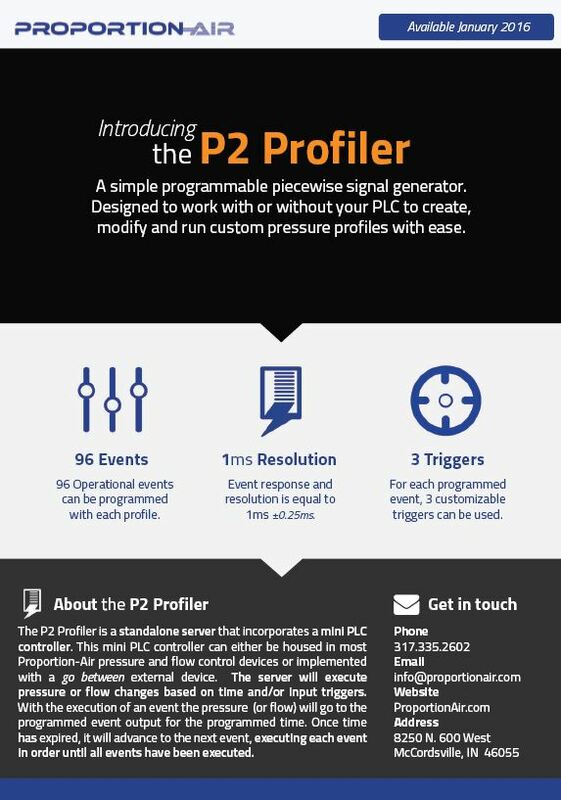 The P2 Profiler is a simple programmable piecewise signal generator designed to work with or without your PLC to create, modify and run custom pressure profiles with ease. A standalone server that incorporates a mini PLC controller that can either be housed in most Proportion-­Air pressure and flow control devices or implemented with a go-between external device. The P2 Profiler can be programmed with up to 96 events, holds a 1ms resolution and 3 triggers per event can be added. Manufacturers design and manufacture check valves and pressure relief valves for specific ranges of pressure based on their customer’s requirement. Each valve manufactured is tested at the end of the production line to ensure it meets the published specification. Proportion­-Air’s electronic pressure regulators are used on valve cracking pressure testers to increase accuracy and efficiency across the whole process. For this application is our repeatability and pressure range capabilities. Repeatability is as high as +/­ 0.02% of full-scale calibration for the QBT Series, for example. Proportion-­Air has just released a new product that can be used along with its electronic regulator for this type of application: The P2 Profiler is a simple programmable piecewise signal generator designed to work with or without your PLC to create, modify and run custom pressure, flow, vacuum, flow or force profiles with ease. It can either be housed in most Proportion-­Air pressure and flow control devices or implemented with a go-between external box. The P2 Profiler will execute pressure or flow changes based on time and/or input triggers. With the execution of an event, the pressure (or flow) will go to the programmed event output for the programmed time. Once time has expired, it will advance to the next event (up to 96 events), executing each event in order until all events have been executed. The unit can also be used as a simple ramp­function generator.